We thank Shoreline for responding to our call for action against the dog meat trade. Home / Blog / We thank Shoreline for responding to our call for action against the dog meat trade. 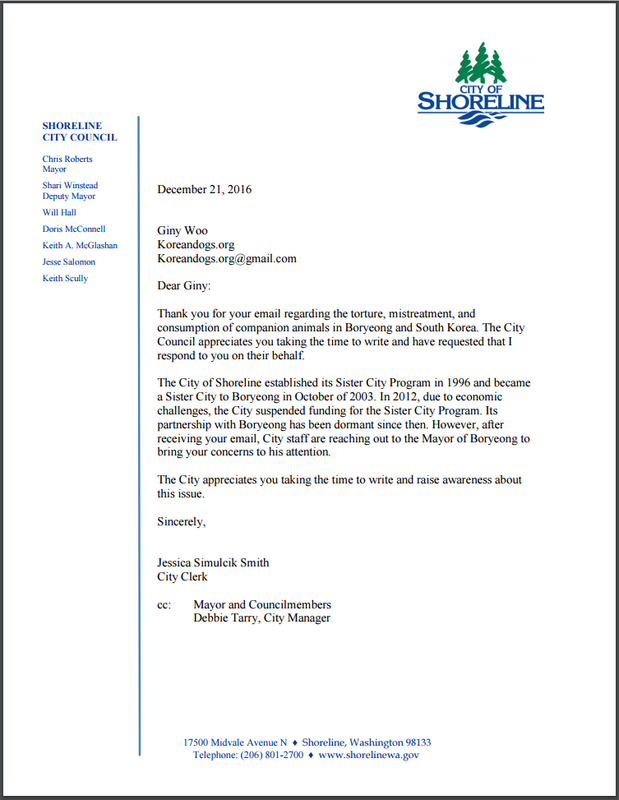 [Update December 21, 2016] Since our previous contact with the City of Shoreline, we have received the following formal letter from the Mayor’s Office. Once again, we would like to pass on our gratitude for their caring about the Korean dogs, and for their leadership in taking such prompt action to help speak out for the animals. On December 12, City of Shoreline has responded to our Boryeong Sister City campaign/petition that we sent to their office (see below), and we are pleased to say that they responded positively. We would like to thank Mayor Roberts and the members of city council of Shoreline for listening to our concerns and taking action. Following our recent petition, through Change.org, about the mistreatment, torture and consumption of companion animals in Boryeong, South Korea, I would like to thank you for letting us know that, even though the City of Shoreline suspended its Sister City Program in 2012, you are still helping to address our concerns, by reaching out to your former counterparts in Boryeong. As you are aware, both domestic and international pressure on this issue is required if we are going to incite some real change in South Korea, so I kindly urge you to continue in these efforts until affirmative action is taken by their authorities to end the horrific and illegal practice of the dog meat trade for good. Thank you again for taking action. Thank you for taking serious steps to help end the dog and cat meat trade. Thank you for your concern. Thank you for helping to end this torture on dogs and dogs. Please e D this horrific , inhumane treatment of loving dogs and cats. Mayor Roberts, Thank you for your help and listening to the concerns of thousands, to end this Horrific and barbaric torture on innocent dogs and cats. Keep the pressure on to ensure that this practice ends forever.